Oxfam International, Center for Economic and Social Right and the Bretton Woods Project hosted a session at the Civil Society Forum at the spring meetings to provide analysis and context from global leaders in human rights, social policy and gender equality, examining the IMF’s pilot surveillance work on inequality and gender and the World Bank’s new gender strategy. The session explored the inter-relationship of certain macro-economic policies and women’s economic inequality and between areas, such as taxation, wage policies, female labour force participation and inequality, and how to achieve women’s economic empowerment. The session included real-world analysis of how human rights are essential to effective design, implementation and monitoring of economic policy. Oxfam has just launched a new report on extreme economic inequality and gender inequality called Women and the 1%: How extreme economic inequality and gender inequality must be tackled together. The report explains how the same forces that drive economic inequality – political capture and market fundamentalism – are also driving greater gender inequality and demonstrates that the rise of extreme economic inequality does serious harm to achieving gender equality. Addressing the structural causes of extreme economic inequality are therefore crucial to tackling gender inequality as well. Recently, many leading figures have championed greater participation of women in the global economy. Evidence shows that women’s economic empowerment is important for both achieving women’s rights and broader development goals. A major McKinsey report released last year indicate women make up half of the world’s working population, but generate just 37 percent of global GDP. It has been calculated that if gender gaps in the economy were closed by countries, an additional $12 trillion could be added to global GDP by 2025. However, Oxfam has shown how in recent decades the majority of those who have benefited from economic growth have been those already at the top end of the income distribution. The top one percent of earners in fact receives more than the bottom 50 percent put together. At the same time the poorest, the majority of whom are women, are failing to see equal rewards. Indeed in many cases women’s low paid labour facilitates greater profits for others. Without also challenging the structural causes of this economic inequality, women – particularly the poorest women – will fail to fairly benefit from growth, even where they are driving it. Oxfam’s research with garment workers in Myanmar has illustrated how without the right policies and practices in place, a booming business environment driven by women workers will not necessarily lead to fair economic benefits for them. The creation of these jobs could offer many women in Myanmar new opportunities for decent work and fair wages; however, the quality of the jobs is key. Currently the industry employs around 300,000 people, 90 percent of whom are young women. Oxfam’s recent research into the sector found that even when they worked overtime, workers’ wages were not enough to meet basic needs such as housing, food and medicine, forcing them to borrow to cover these costs. Under the current system which facilitates extreme economic inequality, the value that their work creates is not fairly benefiting them. Instead, huge profits are accumulated at the top of the supply chain while the rest are left subsisting on poverty wages. This situation is not inevitable. Governments and development actors can implement policies which reduce economic inequality and support gender equality and women’s rights. As well as challenging the social norms which consistently discriminate against women across society, it requires governments to make investments in public services such as universal free education, healthcare and social protection that reduce economic and gender inequality and vulnerability to poverty. A progressive and fair tax system will be essential to these. It also requires the creation of jobs that pay a living wage, the reduction of gender inequalities in work and the recognition, reduction and redistribution of women’s heavy and unequal responsibility for unpaid care work. The World Bank and IMF need to do more to invest in public services. Governments need the fiscal space to be able to make these investments in economic and gender equality but so far the policies of the World Bank and IMF have not supported that. The continuation of the IMF in promoting regressive tax policies such as VAT, as well as cutting social services in response to financial crises are just a few examples of that. The IMF is a relative newcomer to dealing with gender equality, but we have started working in this area because of the realisation that women’s economic empowerment is a macrocritical issue. What I mean by that is that gaps in female labour force participation have significant macroeconomic impacts, meaning significant impacts on growth and sustainability, which is our mandate. So, that means we are focused on this issue from a macro-economic perspective. That is limited in some ways, but it also puts us in a position to bring this issue to whole new audiences, finance ministers, treasuries, who so far have not engaged in this. To demonstrate some figures, female labour force participation rates have stagnated globally at around 50 per cent, but that number masks major differences between regions. This means around 700-800 million women have the potential to contribute more fully to national economies. To be clear, this is about enabling everyone who wants to work, not making women work who do not want to. There are broadly four reasons why we feel women’s economic empowerment can help boost growth and stability. 1. Countries with aging populations are in dire need of boosting their labour force. 2. Evidence is very clear women spend their incomes more on health and education than men. That makes investment in women an investment in the society as a whole. 3. Evidence also show that if women have equal access to inputs as men, results and productivity rise quickly. This is the case from small farms run by women to high levels firms with female board members. 4. Finally, increasing female labour force participation rates improves the talent pool, giving us a wider net of people doing the things they are best at. Without that we are simply wasting talent. Research by Cuberes and Teignier have also demonstrated major income losses due to gender gaps by region, with largest losses being suffered by the MENA region. The IMF has also done research outlining the correlation between gender inequality, income inequality and GDP growth. We have also done work demonstrating the costs of legal barriers to women’s economic equality and the important role for women in boards of firms in Europe. A case study for this work is Japan. Japan faces an aging and shrinking working population. Female labour force rates are well below other OECD countries, yet Japan has an enormous amount of highly educated women. A completely untapped resource. Raising female labour force participation rates to g7 levels would yield 4 per cent GDP per capita gains and increase potential growth rates by 0.2 percentage points. We’ve also done a lot of work in India, where there is a wide variation between individual states, but that gave us the opportunity to look at why these variations exist. We looked at family size, income, education, class, etc. We found there were three factors that were most important. 1. Infrastructure 2. Flexible labour markets 3. Higher social spending on health and education. We also know a few others policies are relevant, like replacing family with individual income taxation, and tax credits for low-wage earners. We have also just started researching gender responsive budgeting, because Indian state level data indicates gender equality indicators are met to a higher degree where gender budgeting had taken place. In recent times the IMF has given greater attention to social protection issues, especially talking about mitigating negative impacts of fiscal adjustment on the poor. The biggest example of that is in 2010, the IMF agreed with the ILO on setting minimum social protection floors. More recently, the IMF has been very engaged in collaborating on sustainable development goals. This is in fact very relevant for social protection and gender equality. As a reminder, Goal 1.3 is: ‘Implement nationally appropriate social protection systems and measures for all, including floors, and by 2030 achieve substantial coverage of the poor and the vulnerable’. Goals 5 and 5.4 are: “Achieve gender equality and empower all women and girls” and “Recognize and value unpaid care and domestic work through the provision of public services, infrastructure and social protection policies and the promotion of shared responsibility within the household and the family as nationally appropriate”. Finally, Goal 10 is to” Reduce inequality within and among countries” and Goal 10.4 is to “Adopt policies, especially fiscal, wage and social protection policies, and progressively achieve greater equality”. These commitments by the global community to social protection are to universal protection, not only to the most vulnerable, and that makes a huge difference. The IMF has long understood its engagement with social protection as indirect, but in the wake of the 2008 financial crisis the IMF has been criticised for pushing extensive austerity without considering social costs and social protection for vulnerable parts of the population. Instead, the Fund can and should advise policies that help mitigate negative social impacts. It is interesting that the Fund relies on the ILO and World Bank on how to incorporate social protection in their policis, as their roles and relationship are substantively different especially relating to gender and universal access. For the ILO, the aim is to achieve universal protection floors for all. On the contrary, the bank and fund have pushed for social safety nets and targeting of only the most vulnerable or poor populations. For the ILO, it is clear their policy is focused on human rights. An example of that is recommendation 202 on social protection floors, which includes references to CEDAW, the Universal Declaration on Human Rights and the Convention on the Rights of the Child, and is based on ideas of dignity and equality. The importance of this difference becomes very clear for example with conditional cash transfers, where it is very clear how not adopting a gender or human rights based approach can lead to unintended unequal impacts. While the World Bank has cash transfer programmes around the world and they are very different, most have a few characteristics in common. For example, the most common characteristic is that women are targeted as the main recipient of the transfers, that is a universal characteristic. However, this targeting is not rights-based, but rather sees women only as a conduit to spend money on useful investments like the education and health of her children. Conditional elements of these programmes may include having to ensure children are vaccinated, have health checks, school attendance, and in most cases noncompliance is penalised, from warnings to permanent exclusion of the programme. While these conditions are trying to achieve worthy outcomes, women are being instrumentalised, and their rights are not respected. These conditions also have unintended consequences. For the ones mentioned for example, additional burdens are imposed on women that may not have been there before, forcing them to perhaps spend even more time on unpaid care work than before. It reinforces traditional family roles and a paternalistic vision where women take care of the home and children. In conclusion I would like to stress that to consider macrosocial issues more consistently requires looking at gender impacts in a more consistent sense, meaning issues like infrastructure and redistributive effects should be taken into account. Women’s economic empowerment can only be achieved through a broader transformation of resource redistribution. Like we just heard conditional cash transfer programmes can sometimes be counterproductive without addressing broader structural policies. Gender equality contributes to broader economic goals, while not all pathways to economic growth lead to increased gender equality. We are all in this room very productive people, which has happened because people have loved and cared for us. This care work is widespread and affects us all and the economy deeply, yet is not distributed equally. More unpaid care work leads to less ability to perform paid work, which leads to less political inclusion, less education and health, which is a vicious cycle. Turning to tax policy, this is a macroeconomic policy lever about who takes up the burden of society. At the domestic level, there is simply a massive shortage of the tax income level itself. Cuts of public services puts more pressure on women’s unpaid work, especially in times of economic crisis. Not having enough tax revenue will be determinative of the level of social spending that is possible, determining how much fiscal space a government has. Second is how tax is raised, who gets the burden and the benefit. There are implicit biases in most tax codes, overreliance on VAT which is regressive is one example of that, which is heavily overused and recommended by the IMF. Meanwhile taxes that target the wealthy are usually underutilised and undertaxed. In totality, this means wealthy men benefit at the expense of poor women when you have a regressive tax system. Women are left plugging revenue and service gaps. Conversely, when well designed human rights and gender informed tax systems are put in place they can be very good tools to enforce a positive cycle. At the international level, there is a relationship between international barriers to raising enough revenue and cross border tax abuse. Secrecy and low tax jurisdictions, based on a system stemming back to the 1920s, are problematic for countries to raise enough revenue to respect gender equality. Funds are shifted by the rich who benefit from these arrangements. Women in poor countries face the biggest burdens of this, facing increasing tax burdens through consumption tax increases, service tax increases etc. This essentially achieves a reverse robin-hood affect, where resources flow out of the hands of the poor and into the financial secrecy jurisdictions of rich white men. I’d like to share a concrete example from brazil to demonstrate what my colleagues argued. Our tax system is very regressive, with 60 per cent of our tax revenue coming from goods and services, which impacts the poor disproportionately. When it comes to income tax, it only makes up 25 per cent of tax revenue, and even that tax is levied unfairly. For those who get minimum wage, tax is progressive as they pay relatively little. But right after minimum wage, it becomes very regressive immediately. Those who earn their money from wealth and capital, they don’t pay tax. Only Brazil and Estonia have such a regressive system. Property is taxed only at 2.5 per cent, which the rich have more of. As a result of this regressive system, 10 per cent of the poorest in Brazil allocate 32 per cent of their income to tax, while the 10 per cent richest allocate only 19 per cent. Who are these poorest people? Black women are the poorest ones in Brazil. Then white women, then black men, then white men. 40 per cent of the poorest persons are black women. 51 per cent of the richest are white men. How can this be changed tax? Fiscal justice reform is the answer, and these solutions are pretty clear. So why has that not happened? When we see the national congress is made up of white men, around 55 years old, highly educated, mostly in business and many are millionaires, the answers become pretty obvious. 80 percent have a university degree, 60 per cent are older than 50. 90 per cent per cent are men. Whose interests are they defending? Not those of Brazilians. We have a law of 1970 that says at least 30 per cent of opposition running should be women, but the law is not followed. It is also not effective because even if it were followed running is not the same as winning, and they would not get elected if they ran. To win an election in Brazil you have to have a lot of money to run, which perpetuates this vicious cycle. So real political reform is first and integral to moving gender equality forward. The supreme court in Brazil just approved business should not be financing the election, election money should only come from individuals. That shows hope for the future. The Bretton Woods Project is a watchdog of the IMF and World Bank for over 20 years. Just like the Fund, we understand and are learning as much as civil society how central gender is to our work. 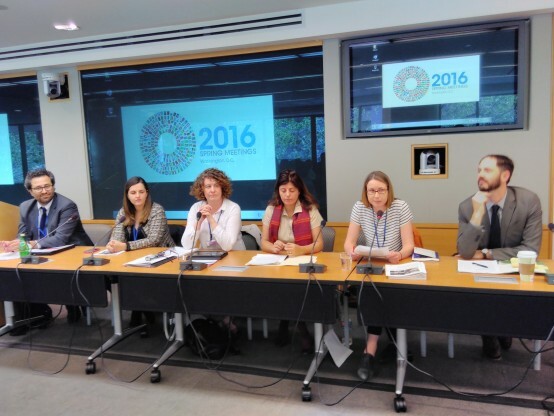 It is important to recognise the IMF is changing, particularly in the field of what it deems macrocritical and part of its mandate, and it is therefore important to understand how the IMF works and what it does to push issues of social protection and gender further. The international financial crisis of 2008 led to an existential crisis of the IMF’s role to play in international finance. The outcome of that is that it is not just there to lend to countries in crisis, but specifically also to maintain stability and prevent crises from taking place, which is mainly expressed through its surveillance and technical assistance work. Replacing group think and outdated approaches to macro-economic policy formation, cracks have started to appear in the IMF’s thinking on the meaning of its macro-critical mandate. In that context, the Fund is rethinking a range of issues, from fiscal multipliers and capital controls to income and gender equality. With this new work the IMF has actually emerged as having a leadership role, with the Managing Director as captain and Kalpana as the engine room so to speak. I’d like to explore what this question of macrocriticality really means. If you look at the research since 2013, there is an increasing recognition of a dynamic aspect of economic policy, versus a static one. It means that classic models of intervention, cuts, austerity and debt sustainability analysis are increasingly not a single intervention. If you look at public services, taxation, infrastructure, you see an IMF that is beginning to approach a deeper understanding of the macrocriticality of these issues. Summarising that civil society has a critical role to engage with the Fund if you care about equality, rights, etc. I see it three ways. 1. This is an opportunity for the IMF to transform, opening Pandora’s box and questioning itself on labour reform, minimum wage, social protection, etc. 2. This is a risk, in that the IMF cannot and should not become the leading institution on women’s economic empowerment. That is not its mandate, nor does it have the capacity or expertise. Instead it should yield to the work of others like UNWomen on how to achieve some of their mutual goals. 3. It is a challenge that faces the IMF and World Bank and others, on how it can continue to deepen and broaden its understanding, how can it be taken forward. We’ve had research and surveillance, some of that has been great, like the 2015 Article IV review of Chile. But how can we give more space to countries to acknowledge and address gender discrimination gaps and empower the voices of those that need to be heard, which historically has not been the IMF’s strength. I therefore call on the Fund to now take this work beyond research and surveillance, towards lending and technical assistance, and call on civil society to engage, as it is an absolutely critical issue for all of us.